How would you like the freedom to build the gate of your dreams? Now you can! 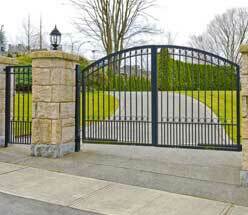 The possibilities of our residential gates are endless. From the colors, styles, width, height, and electric operated gate options, Hohulin can customize entry gates to meet your specific needs! Hohulin Fence provides quality residential gates that are both beautiful and strong. We offer residential gates in wood, vinyl, iron and chain-link options to match any type of fencing structure that our Central Illinois homeowners could need. Our expert craftsmen will install gates of any size and specifications to fit your unique fencing needs. So whether you are designing an entirely new fencing system or simply improving an existing structure, Hohulin is the right choice in residential gates and operators. Click here for Digger Specialties styles and colors. 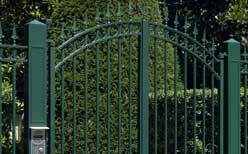 Hohulin Fence installs and maintains electric gate operators for all types of residential gates. We have supplied Linear Osco gate operators for well over 20 years and find them to be a dependable option for powered gate applications. Linear Osco gate operators are available in several different voltage and phase configurations. Electric gate operators can be installed on new installations and also as an aftermarket addition. Hohulin also provides maintenance for existing gate operators. We stock many common replacement parts and access controls. Choose Hohulin for Your Residential Gates and Operators! If you are shopping for residential gates and operators to match your new or existing fence, talk with our team of fully trained fencing professionals today. Contact us online or call us at 309-316-1008. For other residential fencing and related products, see our following pages: Chain Link Fencing, Vinyl Fencing, Ornamental Fencing, Simtek Fencing, Hot-wired Fencing, Residential Kennels, Gates & Operators, and Residential Railings.